What do we mean when we talk about The Future? 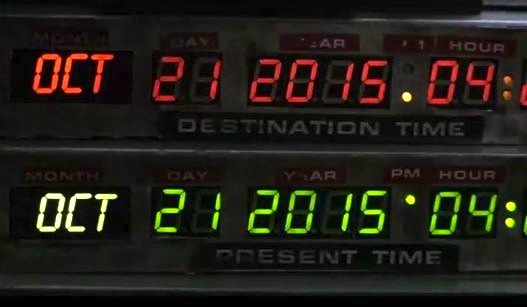 Some of us are keenly aware of October 21st, 2015 as the day Marty McFly goes Back to the Future for a second time. He stepped into a souped up DeLorean in 1985 and ends up in his future, our present. That is the day we take stock of what we have been promised: hover boards, 3d billboards, flying cars, dehydrated pizzas, and dumb hats. Presumably we have to catch up on a lot before then. If only they predicted skinny jeans and Facebook we’d have less anxiety on what we lack. I’m curious, what happens on October 22nd, 2015? Will we be in the future? Is it official then? We’ve already survived Judgment Day several times over, despite the date continually being postponed. Bladerunner is still four years off, but Replicant technology is really lagging. For what it’s worth, I’ve still got my money on Minority Report being the most likely to be accurate. How old the author will be when Minority Report is no longer the future. My main point here is quite obvious, yet I’ll say it clearly: the future will never arrive. Despite this, the concept of The Future is marketed to us relentlessly as a thing, a commodity. The future is no longer an abstraction but a tag line for the newest technology, The Future Is Here or The Future is Now. This tech is always revolutionary in its innovation: augmented reality, 3d printing, nanotechnology, quantum computing. While I am no luddite, I must highlight the underlying trend in our language when it comes to the future. We equate the future with technology. This observation may seem moot. Still, I must advise the reader to develop a sensitivity to “the future” and how it is used in our cultural dialogue. It is used near unilaterally in terms of the cutting edge, version 2 point O, updated and upgraded, tuned up and trimmed in devices, gadgets, gizmos, tools and apps. This belies a general lack of imagination in our society. It is easy to measure time in terms of Xbox, Xbox 360 and Xbox One. It is more difficult to determine here and now in relation to then and there outside of this future talk. Specifically, it is harder to move products when the future is not something that can be bought or sold. I am not advocating an anti-tech world or a retreat into thatched roofs and wood-burning stoves. Incidentally, I cannot deny that technology has allowed me to share my thoughts with you. I am awash with technology. I am implants away from being a cyborg. You are too. Technology is part of our future, but it is not our future. Perhaps what I am asking you to do is use your imagination when you think of the future–something outside the world of buttons and speed and usability. While our tech will still be with us in that future (nerd caveat: barring a massive solar storm or EMP attack), we can also assume the earth and the people in it will be there too. Maybe when we’re dreaming of self-driving cars we can also dream of social and economic equality. Can it be that in fifty years we have not only the ability to translate foreign languages in real time, but we can also truly listen to what other cultures have to say with the spirit of understanding? Perhaps we can workshop what Krista Tippet calls a “spiritual technology”: compassion. These are all lofty and idealistic goals, but I believe we can achieve these in the future. The trick, I believe, is to reclaim the tired phrases I mentioned earlier from the grips of glib commercialism. The Future is Now. The Future is Here. We build it every day of our lives. It’s not as easy as a download or a blog post, but I suspect it is more rewarding. If we want life to be a certain way then we must live in accordance with that desire. What kind of future can you imagine? 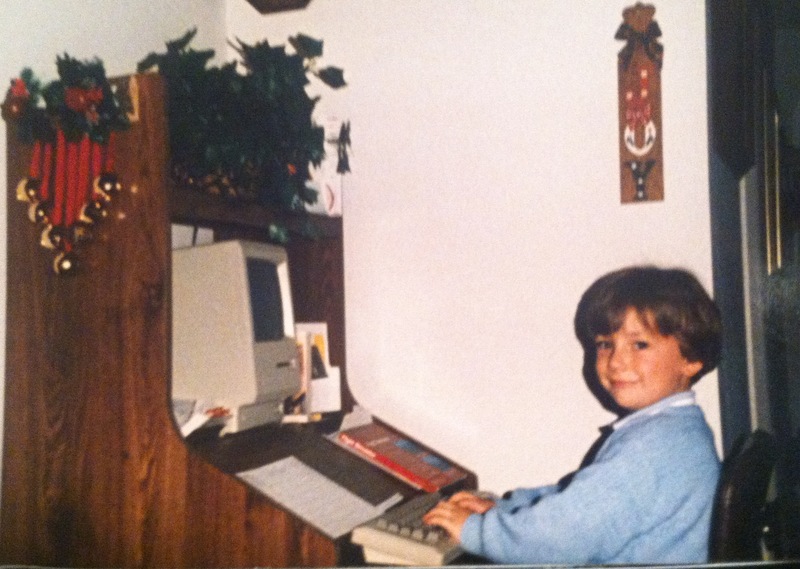 The author establishing OG Tech Cred in the past future.